Last week on Mama Monday, I started discussing that dreaded six-letter word: CHORES. This week is the rubber-meets-the-road part of the discussion. Just how do we get our kids to pitch in around the house? I've seen (and invented) more chore systems then any family would ever need. I've heard the arguments about paying for chores (they are working and we get paid when we work) versus not paying for chores (they need to realize that they are part of the family and should pitch in for that reason not because they are going to get something). So here is how I combined all of that information into a system that works for our family. Maybe it will help you figure out something that will work for yours as well. 1. To Pay or Not to Pay? That is the Question. Should you pay for your children to do chores? Yes, we get paid for our labors, so children should learn the value of a dollar. They need to learn how to save, how to give, and how to spend wisely. This is best learned while under your roof instead of as a freshman in college when all of those credit card applications show up in their incoming freshman packet. I don't believe that children should get an allowance, though, just for existing (aka doing nothing to earn it). Should you expect your children to do chores just because they are a member of the family and need to pull their own weight? Yes, we all have to learn how to keep house. Children need to learn that keeping house does not come with a paycheck (I'm still waiting on my first one and I've been a SAHM for almost 8 years now!). So how do you combine these two seemingly opposite views....read on. 2. A Workman is Only as Good as His Tools. Don't set your children up to fail. Don't set yourself up to lose your temper. When I first started this chore quest, I handed Chipette (age 4 at the time) a cleaning rag, a bottle of Windex, and asked her to clean off the front of the oven. About five minutes later Chipette walks up to me with a cleaning rag dripping Windex because she had used so much and tells me that she is done with her job. And then I lose it, "Why did you use so much Windex? You don't need that much just to clean the front of the stove! Just spray a little bit and wipe it off!" After this happened with dusting (Pledge soaked rag this time) and cleaning the bathroom sink (Scrubbing Bubbles rag for try number three), I realized that when you hand a 4 year old anything that sprays, they are going to spray and spray and spray and spray...and then spray one more time just to be sure it's clean. Now my kids have their own cleaning caddys which contain Pledge wipes, Swiffer dusters, Windex wipes, and Clorox wipes. No more nightly meetings to Sprayers Anonymous for my children, no more blow ups by mom, and the wipes are given out one at a time by me. Set your children up to succeed. 3. So What's the System Already?!? Well, I couldn't tell you how it worked right off the bat! First, Chipette and Magpie have morning chores, afternoon chores, and evening chores. They DO NOT get paid for these chores. These chores are part of their responsibility to contribute to our family. The non-paying chores are things that Chipette and Magpie have been trained to do and are able to do them by themselves. Examples of these types of chores are making their beds, emptying the dishwasher, and taking out the trash. Second, Chipette and Magpie also have chores that they can CHOOSE to do each day if they want to and they WILL get paid for these. These chores are chores off of my chore list that they are able to do with supervision. For example, when we are working on cleaning the living room, they can get paid for dusting the lower half of the room, vaccuming the edges of the carpet with our handvac, and cleaning the inside of the living room window. They are paid ten cents a chore. Usually I offer them about three paid chores, each day, five days a week. It's possible they can earn $1.50 a week. If they do all of their extra chores for an entire month, then they will get a $2 bonus at the end of the month. However, if they do all of their paid chores in the day, but "forget" to pick up their toys, then they will not get paid. All family chores must be completed that day to get the money for your paid chores. This keeps them from just doing the paid chores, but refusing to do the others. Paying for chores gives you a new discipline strategy (You will replace all of the Expo markers that brother bit the ends off of because you didn't put them up! ), and if they want something at the store, they have thier own money to buy it. 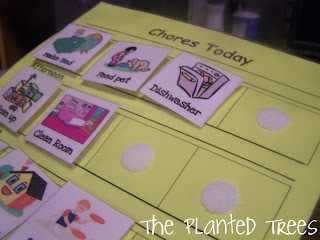 Third, I use picture cards and a chore chart to show what chores they have to do that day. 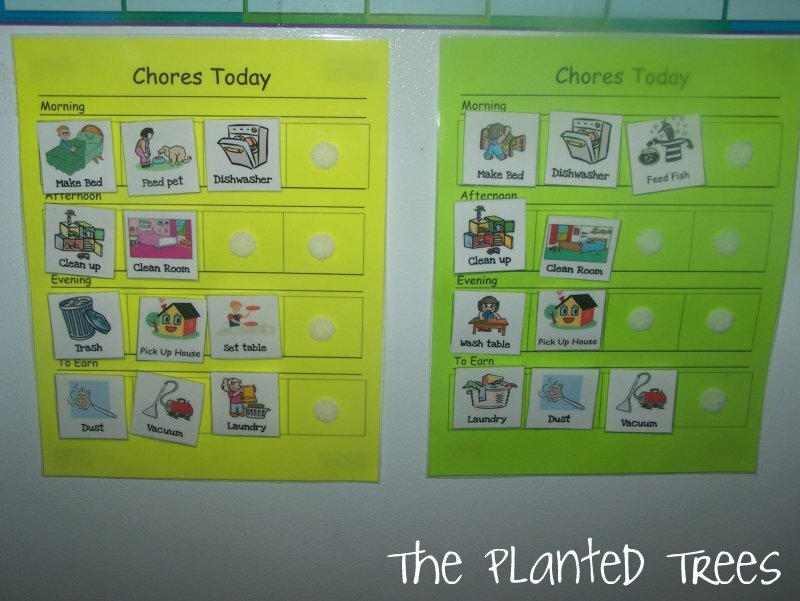 This way even your toddlers and preschoolers who can't read yet can understand what chores they need to do. Chipette, age 7, still likes the picture cards eventhough she can read. When she does outgrow the pictures, though, I can easily start writing on her chart with a dry erase marker each day. 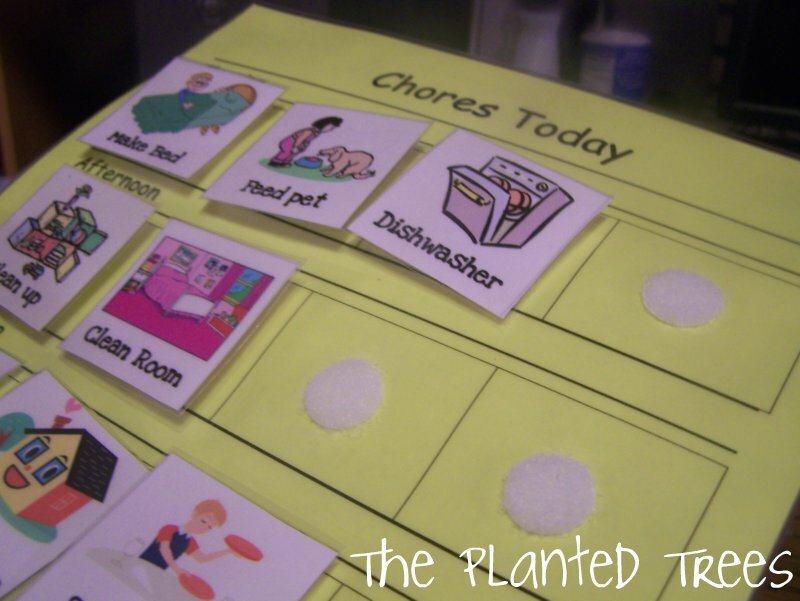 This is a picture of Chipette's chore chart. You can easily see her chore categories of morning, afternoon, evening, and to earn. 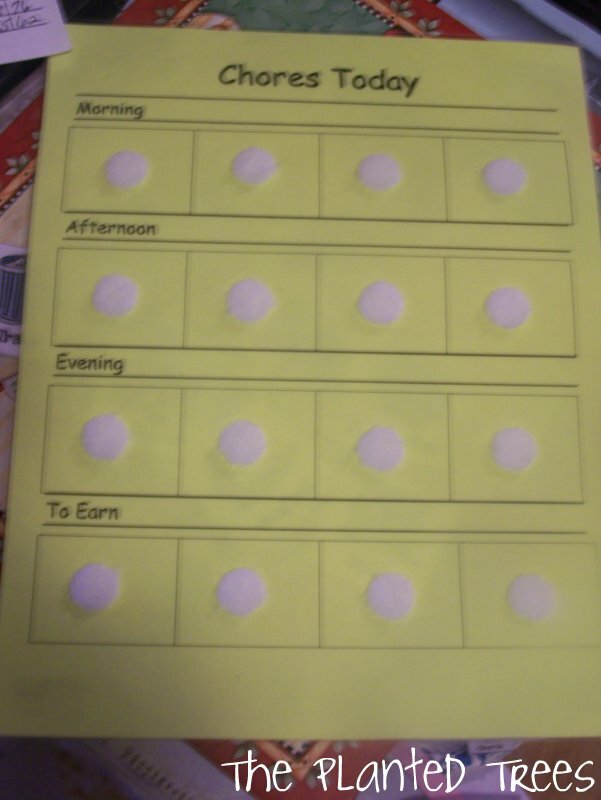 I put velcro dots on the chart and on the back of the chore picture cards so that when they are done with that chore, they take it off the chart, bring it to me, and I go inspect their work. If it is a complete job, then the card is put away until tomorrow. If not, then they try again. 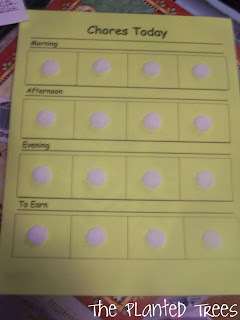 Here is what the chart looks like with the chore picture cards on it. 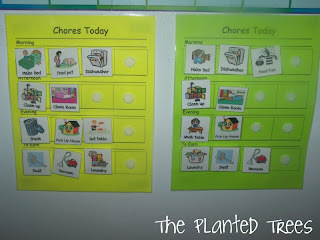 We hang our chore charts on the side of the refrigerator by putting magnet strips on the back. They are up high enough so little Monkey hands can't reach them! I keep the chore picture cards on top of the fridge in a plastic storage container. Here are Chipette and Magpie's chore charts on the refrigerator filled in for a typical Monday. I keep one of those magnetic note pads on the fridge where I write what each child has earned that day for their chores. They get paid every Saturday morning and keep some out to give to others (church contribution, missionary support, Angel Tree at Christmas, etc. ), some to save, and the rest to spend. I do laminate everything for durability. If you are looking for where to get the chore charts and the chore cards, then I would be remiss if I didn't direct you to Homeschool Creations who was the inspiration for my system and where I found my chore cards. My chore chart is a little different than hers (mine has an evening chore category), but it is easy to make the picture cards and the chore chart using the "Make Table" feature in Microsoft Word if you wanted to customize yours as well. That is our system in a nutshell. Feel free to post any questions in the comments section because I'm sure I didn't explain something well enough! Wow! Love the charts! With the new year I am looking for ways to improve "Chore Time" around here...and I like your plan. We will be giving this a try this week. Thanks for sharing! I hope it worked for you, Charlene. The link worked for me Kim, so I'm not sure what to tell you? You might try going to Homeschool Creations. The link would be under Mom Helps, then Chores. All of my chore cards came from Homeschool Creations, but it's not hard to make yourself with some Microsoft Word clip art.